BAC Supplies Ventilation & Ducting distributors. If in the unfortunate event that the item arrives damaged please drop us a line and we will be happy to resolve the problem. 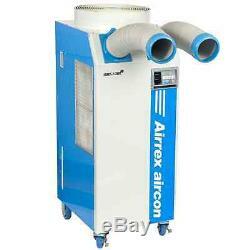 AIRREX HSC2500 6.1Kw 21,000btu INDUSTRIAL PORTABLE AIR CONDITIONER. The Airrex HSC2500 6.1Kw (21,000btu) commercial mobile air conditioning system. The Airrex range are designed for industrial / semi industrial use. This unit is ideal for factories, industrial use, laboratories, printing workshops, server rooms / computer rooms and telecomms rooms. They are ideal for spot cooling as well as for keeping computers and other heat sensitive equipment cool. 21,000btu (6.1kw) Cooling Output. In "room/area" mode, for areas up to 525 sq. Operates from UK standard 220/240v 50Hz. 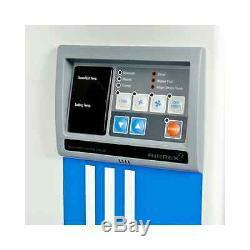 Digital Controller with Off timer, Temperature Control, Self Checking and Emergency operation. 20ºC to 45ºC Operating range. Tank full warning - Capacity between 8-9 litres optional condensate pump with outlet hose available. 230V, 50hz, single phase power requirement. Exhaust duct is not supplied, and can be extended to 29.5ft. Aluminium mesh filters for easy cleaning and long life. Two flexible directional cold air outlet ducts assumes 8ft (2.6m) ceiling height. The item "AIRREX HSC2500 6.1Kw 21,000btu INDUSTRIAL PORTABLE AIR CONDITIONING UNIT" is in sale since Monday, January 11, 2016. This item is in the category "Home, Furniture & DIY\Heating, Cooling & Air\Other Heating, Cooling & Air". The seller is "bacsuppliesltd" and is located in OLNEY, Buckinghamshire. This item can be shipped to United Kingdom.